Geist is one of White Wolf’s more recent system releases, and it’s also one of my favorites. You play as a Sin-Eater; a relatively ordinary mortal who suffered a premature death only to be dragged back into the land of the living by a Geist, a bizarre entity from beyond time and space. Having cut a deal with the dead, the Sin-Eaters act as gatekeepers between the worlds of the living and the deceased. They help pacify angry ghosts, protect the living and dead alike from the predations of the supernatural and even make the occasional perilous run into the Underworld itself as the need arises. While life as a Sin-Eater can be bizarre and miserable, it is the strange and tumultuous life of a hard-boiled detective as opposed to a never-ending parade of suffering and drudgery that one might expect. The image links to the free quick-starter document on DrivethruRPG, and I highly suggest that you download it and give the system a try. After the jump we’ll take a look at some new Geists your character could use, one for each type of Sin-Eater, and see how these strange, alien beings can aid and influence your character. Likely Candidates: Those who have been executed on false convictions, strangulation victims, anyone murdered on or near a railroad. A hulking monolith of a Geist, the Gavel stands at a height taller than any human should have been able to reach. Workman’s coveralls, bloody and frayed with grief and age, serve as his only garments, his bare feet leaving prints of wet, crimson soot in his wake. Knotted, rough-hewn muscles stand out in painful detail beneath the dark, mahogany skin that’s stretched a little too tightly across his gigantic body. His features remain a mystery, concealed beneath a sack of rough burlap that’s been pinned in place with a severed hangman’s noose. The Gavel is a grim, humorless spirit that constantly drives the Sin-Eater to free the ghosts of the unjustly slain and punish their transgressors, usually by directing the Sin-Eater with graceful twirls of the large, rusty sledgehammer that dances between his gnarled fingers like a child’s toy. He can be difficult to work with due to rigid adherence to the just, methodical punishment of the wicked… and the fact that his voice is a low, wheezing rasp, frequently intelligible only when echoed in the rumble of a passing railcar or the crackling roar of thunder. Crucifixion seems to be his preferred method of justice, though the Gavel will accept most any execution so long as it is performed with a decent amount of ceremony and process. Luckily, most ghosts are able to identify their killers with a reasonable degree of accuracy, making it fairly simple to avoid killing the wrong individual. The Gavel is, however, extremely particular about Due Process, and will not tolerate lackadaisical investigations or executions performed without sufficient evidence. Killing an innocent man without proper cause will earn you the Geist’s enmity, though he is generally indifferent to allowing others to die through inaction and other such “hands off” forms of murder. Likes: Justice, rum, the early recordings of music, ritualized executions, railways, hammers. Dislikes: False convictions, laziness, cutting corners, carrion birds. Likely Candidates: The children of addicts, victims of starvation or neglect, diabetics. While one of the less dangerous and unpredictable Geists, Poppyback is definitely one of the more unsettling. Suffering the body of a malnourished, ashen-skinned child, the Geist sports a stylized Calavera mask with a wide, open mouth in lieu of a head, crawling around on spindly limbs that are long enough to have belonged to a fully grown man. There is an empty divot of flesh where his stomach should have been, and a small patch of bright red poppies sprouts directly from the cadaverous skin on his back. A closer examination of the flowers reveals a tiny, accusing eye in the center of each one, as well as a hidden, bristling forest of crimson-stained steel needles. Poppyback is somewhat easy to please, and a Sin-Eater can usually mollify him by playing games in the park, watching movies or cartoons, or eating a vanilla bean ice cream cone sprinkled in cinnamon-sugar. He will, however, grow incredibly fussy and unreasonable if the character does not eat an appropriately lavish and filling meal at least once per day. Juicy cuts of meat, generous heapings of bread and pasta, tarts, pastries and other desserts are all good candidates, though he will typically drive the Sin-Eater in the direction of eating their own favorite foods rather than something selected by the Geist himself. If questioned about this particular insistence, the Geist will calmly explain, in a rambling, sing-song voice, that today is the day that the Sin-Eater is going to die, and they’d better have a decent meal in their stomach before they go. Likes: Candy, ice cream, children’s games, big meals, fancy restaurants, Thunder Cats, Animaniacs, Spongebob. Dislikes: Hard drugs, excessive violence, confined spaces, Bikram Yoga. Aspect/Keystone: The Slaughter of Rivals. The Geist known as “Wolframe” is, simply put, a creature of nightmare. A swift, humanoid golem wrought from the dessicated bones of dear with jagged-thorned blackberry vines acting as sinew, thrusting crudely out through a crude skin of rotting wolf-hides, its motives remain an utter mystery. Rotting, turgid eyes regard the Sin-Eater in constant judgment, and it barks dark, primal commands through seemingly endless rows of jagged teeth stolen a dozen different predators. 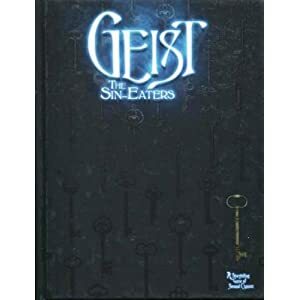 The Geist seems driven to make something out of nothing, and it’s careful selection in Sin Eaters reflects this driving philosophy. Wolframe will pass over hunters, park rangers, and other skilled woodsmen in favor of those who do not belong in the woodlands at all. Far preferable is the inner city artist who drowned in shallow water because they never learned how to swim, or the gaming fanatic with a thousand allergies who happened to find the bee with his name on it after finally getting dragged away from the console for an ill-fated hiking trip. Those saved from a trip to the underworld from this Geist will likely wish they had simply chosen to succumb to death instead. Wolframe tolerates no weakness, and is constantly haranguing the Sin-Eater into forging themselves into the pinnacle of excellence while bloodily crushing any who would challenge them into the dirt. While this constant drive usually leaves the Geist significantly improved over their past selves, they are often possessed of a haunted, tired look and seem to be constantly distracted, as trying to tune out a stream of endless spectral nattering. Likes: Hunting, combat sports, competition, raw meat. Dislikes: Weakness, lethargy, television, defeat. Likely Candidates: Those killed by pollutants or chronic exposure to toxins on the job, victims of corporate malfeasance. A tumor-riddled man slipping away in the cancer ward, a steady-stream of radiation from a faulty containment system having slowly devouring him from the inside. Alone and largely forgotten, his final visitor is a squat, simian man with freakishly long arms and a concrete cigar dangling from pale, atrophied lips, fumigating the room with a faint, noxious haze. Clad in an oily black suit and sporting a tie intricately woven from a thousand tiny chains, he offers a contract written in smudged ink on soft, luxurious paper. Your Sin-Eater has just signed a deal with Suit-and-Chain, a second shot at life given in exchange for letting the Geist play permanent piggyback with your senses, starting right now. As they sign the deal, the brass-and-bone beetle perched at the gaping hole in his throat assures you that everything will be just dandy while the Geist looks onward with a wide, wordless smile. Likes: Contracts, fine items and luxury goods, conquest. Dislikes: Organic produce, filters, clean apartments. Likely Candidates: Victims of vehicular collisions, especially if alcohol is involved. Your Sin-Eater’s relationship with the Wheelman will depend heavily on how they died. Those who were struck and killed by another driver will find the Geist an oddly comforting presence, in spite of being a nightmarish ruin of human flesh stretched over a skeleton of jagged, mangled metal. The opposite is true of those who were at fault in the collision. He will drag them back from the dead, but will generally ensure that the rest of their unnatural lives are spent in hellish servitude to the dead. With a jagged crown of car keys thrust through the top of his skull and vaguely human eyes the syrupy green shade of whiskey and antifreeze slowly blending on the pavement, he is one of the more unpleasant Geists to look at. He is far more unpleasant to look at, and will often demand that vengeance upon the wicked be delivered in a way that sates his need for a deadly, cacophonous collision. Likes: Muscle cars, large vehicles, petroleum, the jangle of keys. Dislikes: School Zones, AA Meetings. How Else Could the Die Roll?